This tough perennnial plant belongs to the sunflower family. 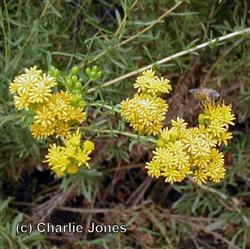 You will notice it's disk shaped yellow flowers bringing color to the coastal sage scrub in late summer and fall when not much else is blooming. This is a popular plant for restoration projects.